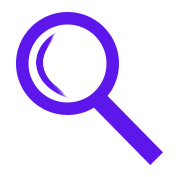 Scroll below to see all our topic-based recomendations! 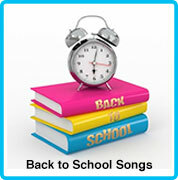 Songs can be an ideal way to get children involved and interested in a daily routine or help to solidify a new skill through repetition. 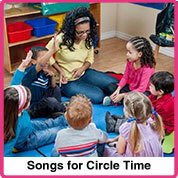 Pairing directions with familiar song melodies adds an element of fun and also provides structure to the daily schedule. 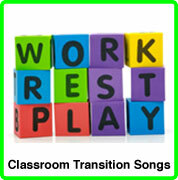 Teachers find that these tunes make classroom transitions almost effortless! 1. 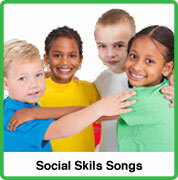 Choose the target skill you want the child to accomplish such as lining up for recess. 4. 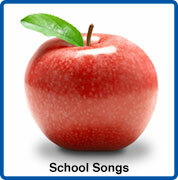 Start with one phrase relating to the skill and see if it fits logically within the song. For example “Line up at the door.” could be exchanged for “Farmer and the dell” using the same tune. 5. 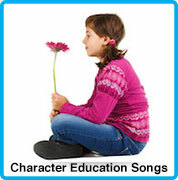 Adapt the song as needed to fit in each direction you need to give for the desired skill. For example, when it's time to line up, this song will facilitate the transition. Let's line up at the door. day it is, day it is? month it is, month it is? Do you know what month it is? I'll show them all to you. For a nap, for a nap? Then we'll rest, then we'll rest. Squishing and squashing in the dough. 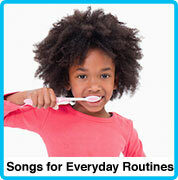 brush our teeth, brush our teeth. to get them sparkling clean. tie our shoes, tie our shoes. we lace them so they're tight. If your name begins with “B” then go to snack. If you're wearing something red then go to snack. Then you can stand and go to snack. It's time to wash our hands. and then our job is done. 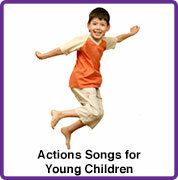 Other melodies that easily lend themselves to transitions and the teaching of elementary concepts include: Twinkle, Twinkle Little Star, Mary Had a Little Lamb, Jingle Bells, The Muffin Man, Ten Little Indians, The Bear Went Over the Mountain, She'll Be Coming ‘Round the Mountain, and Did You Ever See a Lassie. Michelle Lazar, MT-BC, directs Coast Music Therapy , a San Diego-based agency focused on providing a creative approach to learning through music. 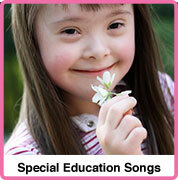 She specializes in meeting the learning needs of children with autism and developmental disabilities. She also provides consultation, workshops and training seminars nationally for educators in both special and regular education classrooms. Michelle holds a baccalaureate degree in Music Therapy from Western Michigan University, with additional training in Neurologic Music Therapy from the Center for Biomedical Research in Music at Colorado State University. Her publications include a chapter in Models of Music Therapy Interventions in School Settings, 2002 edition by Brian L. Wilson. 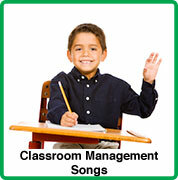 Michelle offers other practical tips for music-assisted learning at www.coastmusictherapy.com .